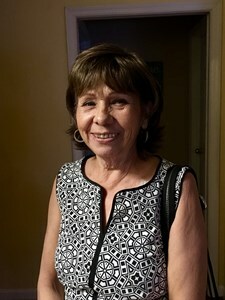 Milady (Reyes) Garcia; March 10th, 1954, at 64 years old, has joined her late husband after a long battle with Ovarian cancer on August 9, 2018. She served others as a nurses aid up north before moving to Florida. After her family’s move, she had a long successful career in telecom. She worked very hard as a student, wife, and mother while working a full time career; earning her bachelor's degree in business. Milady was an active member of Nativity Catholic Church in Longwood and enjoyed volunteering when in good health. Her favorite pastimes included gardening and crocheting. The highlight of her life were her four grandchildren; Edward Michael Ryan, Tristan Luke Holder, Keagan John Holder, and Ambrielle Faith Holder. Milady is survived by her three brothers; Jorge Reyes, Israel Reyes, and Hector Acevedo in addition to her two daughters Michelle Garcia Ryan and Marsha Garcia Holder. Memorial services will be held Wednesday, August 15, 2018 at 12:00 pm at Nativity Catholic Church in Longwood. Add your memories to the guest book of Milady Garcia. My sincere condolences for the loss of your precious Milady. May you find comfort in God’s promise of a resurrection where he will restore life to those whom we lost in death on a paradise earth.